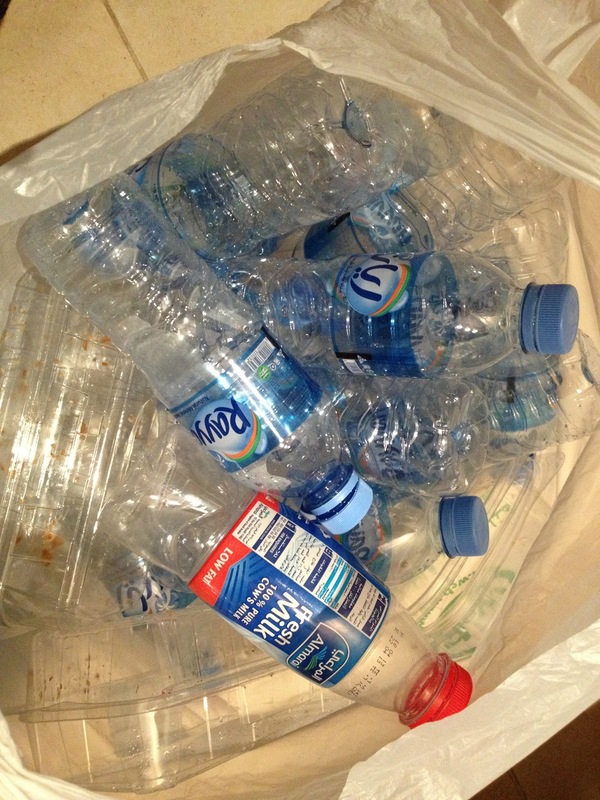 I'm just back from my weekly recycling trip to one of the only recycling facilities in Doha, or so it seems. The lack of recycling facilities here was one of the first things I noticed and it instantly made me very uncomfortable. 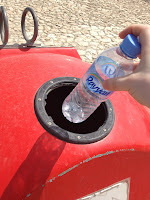 In the UK we are so used to being able to recycle everything from paper to plastics, cardboard to cans, even compost our waste and I've been doing that since I can remember. Recycling is as natural as breathing and not to be able to do it is psychological suffocation...... impossible to tolerate. 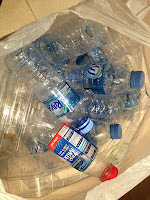 So, rather than throw my plastic bottles in the bin, I kept them until I could find a way of recycling them. And do they use alot of them? Oh my goodness......particularly at work - they buy bulk loads of little bottles of mineral water and the kitchen guys hand them around to the offices all day - they must get through hundreds every day. And there are no facilities for paper recycling. An American colleague of mine enquired into getting a contractor to provide recycling facilities and they quoted £3,000 per month to supply bins and a collection. 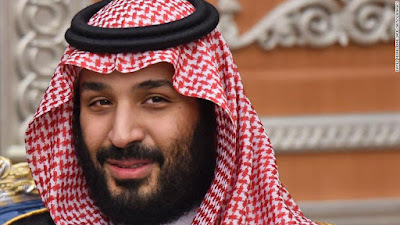 Unfortunately, given all the other change going on at Al Jazeera, this is not a priority for them at the moment so is a hard sell. 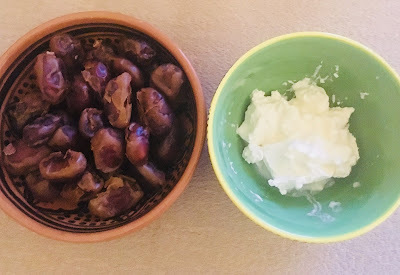 But I decided I must at least do something on an individual level as a start. So I researched recycling facilities in Doha on the internet and came across Sustainable Qatar - an independent volunteer based organisation to promote environmental awareness within the Qatar community. 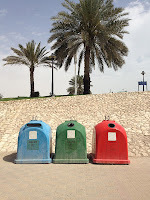 On their site, they list just two placed for recycling - Katara Cultural Village which is in West Bay, far from my hotel, and Alrmailah Family Park, opposite the corniche, about 40 minutes walk from my hotel. So every Saturday morning, I get up early to avoid the heat, pack all my recycling into my rucksack and bag and head off to the park to recycle it. 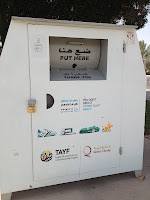 The great thing is that they dont just have recycling bins, but there is also a charity bin there too. 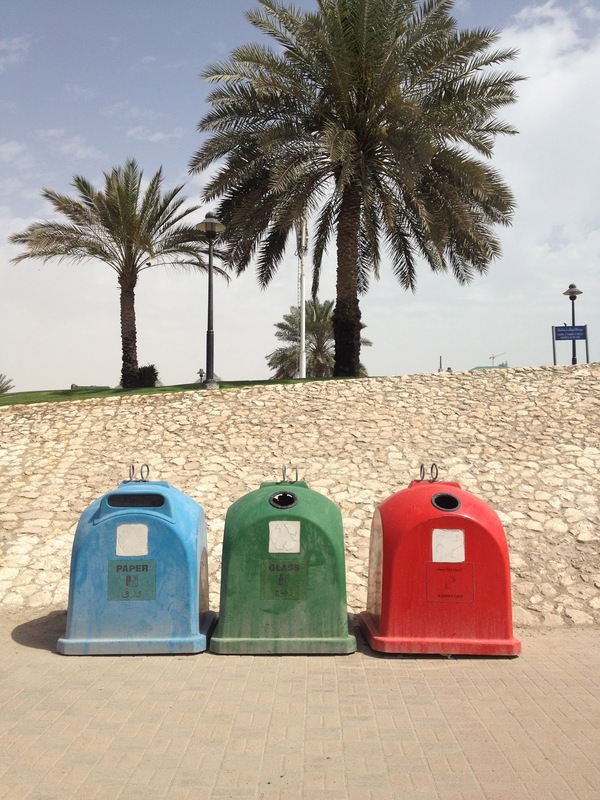 And Ive seen more of these in other locations along the Corniche, so there are some promising signs! So far, the count is 72 individual items including 44 plastic bottles, 19 misc plastic containers, 3 cans and 1 egg box, plus a few other bits and pieces! The first couple of times, i looked inside the bins and it looked like I was the only one using them, but today the plastics bin was almost half full!! My challenge will be taking that walk in the hot summer months when the temperature creeps up towards 50 degrees. Ive been told that its not possible to even stand outside, let alone walk 40 minutes!.... Well I will cross that bridge when it comes........ as my hotel manager so sinisterly put it yesterday, "...we are waiting for the pizza oven to come!!" Sadly, its not there at the moment because they're doing some renovations to Rumailah Park. Sadly, The Museum of Islamic Art has a park cafe which recycles a small amount of waste - but really their recycle bins are only for the cafe so they're small. I do go there and take my recycling sometimes. Other than that, I haven't found anywhere else!! Its not exactly top of the priorities here, it seems! !